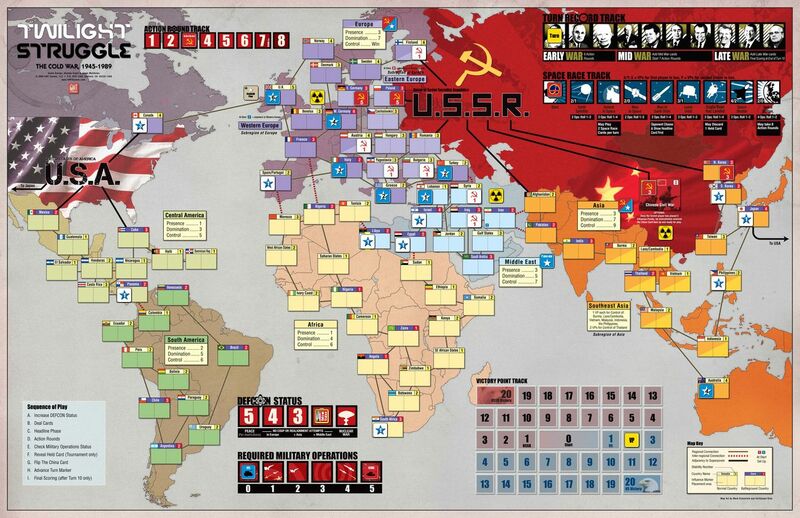 Twilight Struggle is a two player game simulating The Cold War, where the players assume the role of the two remaining superpowers; The USA and the USSR. The game takes the viewpoint that all other countries are just staging grounds and battlefields between the two, subject to their Influence and backdrops to bloody Coups. Players manipulate historical events to their advantage, or their opponents disadvantage, to further their spheres of influence. The main determination of the victor is, fittingly, the player that accumulates the most Victory Points. If one player succeeds in obtaining 20 Victory Points, they immediately win the game. There are also a few ways the game can end without Victory Points; please see Ending the Game, below. The game is played over 10 turns. Each turn, a player is dealt a number of cards to bring their hand up to 8 cards in turns 1-3, and 9 cards in turns 4-10. These cards can be used in one of a few different ways; they can be used to bring about the event listed on them, i.e. Cuban Missile Crisis, UN Intervention, etc. These cards also have a value on them, from 1 to 4, that demonstrates their resources that could instead be used to perform Operations around the world. This is called their Ops Value. Finally, if a player wants to, they can instead use a card to further their progress in the Space Race between America and Russia, which could provide both Victory Points and extra abilities. Players alternate playing these cards between the two of them for a variable number of rounds, with the typical result being each player having one card left in their hand. After that, various upkeep duties are performed, and the next turn proceeds in the same fashion, until the end of Turn 10. After Turn 10 is ended, a Final Scoring is taken; the control of every region on the globe is judged, with more control awarding more Victory Points. As before, the player that ends with the most VP’s is the winner. The first thing done at the start of each turn is to increase the global DEFCON (Defensive Condition) status one closer to 5, or world peace. Certain player actions and cards played during the round can bring this number down, or closer to war. The lower the number is, the more restricted military actions will be. If the active player does an action or plays a card that would lower the DEFCON to 1, the world is unable to handle the tension, and erupts in nuclear war. The player that causes the DEFCON meter to reach 1 automatically loses the game. After raising the DEFCON status, each player draws from a deck of cards, to a hand size of 8 (in Turns 1-3) or 9 (Turns 4-10). Each of these cards represents an Event they can turn to their advantage. As the Cold War progresses, more cards are added to this deck, to represent additional developments and twists of fate. Turns 1-3 represent the Early Years of the Cold War. At the end of Turn 3, players have reached the Mid Years of the Cold War, and more cards are shuffled into the draw deck to represent that. At the end of Turn 7, the war enters its Later years, and more cards representing that are shuffled in then. When there are no more cards in the draw deck, the discards are shuffled to make a new draw deck. Public perception carried significant weight in this conflict, and much effort was made to control what the people read in their newspapers. This is represented by the Headline Phase. Each player selects an event from their hand that they would like to see occur. Both players play their card simultaneously. The card that has the highest Ops Value occurs first. This phase ensures that players do not just concern themselves with Operations, but that Events are played as well. The center part is the name of the card. The top bar tells you what phase of the war it occurs in. The “3" in the star to the left tells us that the card is worth three points when used for Operations, and since the star is red, that this card favors the USSR Blue favors US, and stars with both colors favor neither. Note that some cards have an * and underlined text. Cards with underlined text have certain effects that continue to persist until they are cancelled later on. Cards with an * that are used to play an Event are permanently removed from the game, so be careful to maximize their impact. Some cards are prerequisites for others later on, and some cards cancel others out. There are also certain cards that can immediately begin tallying the amount of control for each superpower in a particular region. There are three main ways to use a card: For the Event, for Ops, and for the Space Race. A card can always be played so the Event text can occur. Going back to the Warsaw Pact card, the USSR player can play the card for its Event, and can begin to manipulate the influence of Eastern Europe. It remains in play because it enables the play of the NATO card later on. 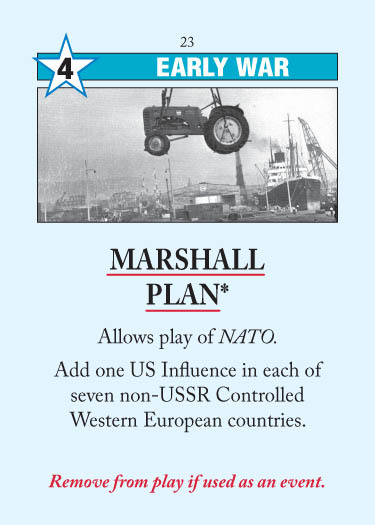 If this card is used for its Event, since it is marked with an *, it is removed from the game as soon as its effects are no longer in play(in this case, when the NATO card is played). A card can also be used to perform Operations. In this case, the player has a number of Ops points equal to the Ops Value of the card to perform Operations. A player can spend these points to either spread influence, Realign countries to their view, or perform Coups to radically change countries’ allegiances. You must spend all of your Ops points on ONE of these choices. You cannot mix and match. Bulgaria has a Stability Number of 3. If the USSR has 3 influence in the country and the US has none, then the USSR controls Bulgaria. If the US then places 2 influence in Bulgaria, the USSR no longer controls Bulgaria, because they don’t have enough influence to cover the difference(Base Stability of 3 + US influence of 2 = required influence of 5 to control Bulgaria). It costs 1 Ops point to place 1 point of influence in a country that is uncontrolled, or controlled by you. To place 1 point of influence in an enemy-controlled country, it requires 2 ops points. Going back to the Warsaw Pact example, the USSR decides to use it to place Influence. He places 1 influence in West Germany to begin his takeover of the American-controlled country. It costs 2 points to do so. With one point left, he solidifies his hold on Syria, by spending the remaining point to gain 1 influence there. You can only place influence in a country if it contains, or is adjacent to a country with friendly influence markers at the start of this action round, unless an Event tells you otherwise. Although Realignment rolls can reduce your opponent’s influence, they can never add your influence to a country. A Coup represents operations short of full-scale war to change the composition of a country’s government. You do not have to have any influence in a country to attempt a coup, although your opponent must have influence there. To perform a Coup, roll a die and add the Ops Value of the card played to enable it. If your total is greater than double the country’s Stability Number, your Coup is successful, and you reduce your opponent’s influence by the difference. If that takes your opponent’s influence to 0, you place your influence in the country to round out the difference. Ex. Iran’s Stability is 2, and the USSR has 3 influence there. 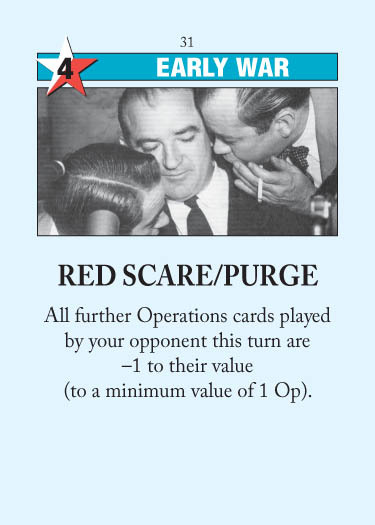 The US performs a Coup with a 3 Ops Value card. Their roll is a 5, total of 8 with their added Ops Value. 8 > 4, so the Coup is successful. The USSR loses all three influence, and since there is still one point unaccounted for, the US gains a point of influence in Iran. Certain countries find themselves a more desirable target than others. These countries are called battleground countries, and are distinguished by their name bar being in purple. If a battleground country is the target of a coup, the world notices, and the DEFCON track is decreased by 1. Also, when a card is played for a Coup, you move your marker down the Required Military Operations track a number equal to the Ops Value of the card used. More on this later. - If the opponent's event is prohibited by a previously played card, Operations take place, but the Event does not, and the card is discarded as normal. - If the opponent's event is triggered, but results in no effect, the card is considered played and removed from the game. Certain cards have no events or Ops points, but instead are Scoring cards for a particular region. Scoring cards can NEVER be the last card held in your hand at the end of a turn. 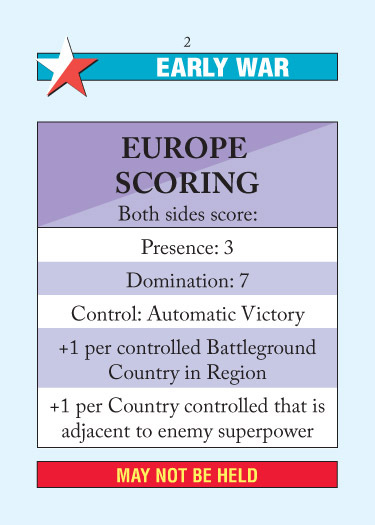 When a scoring card is played, players calculate how much influence they have in countries in that particular continent. There are three levels: Presence, where you have control of at least one country in that continent; Dominance, where you control both more normal countries and battleground countries in that continent than your opponent, and Control, where you control both more countries than your opponent, and ALL of the battleground countries. These scoring cards can often provide a large and sudden influx of VP's to a player. Ops Points may be spent by a superpower to move its marker further down the Space Race track, instead of for Operations or Events. To do so, discard a card with the number of Ops points required, as listed on the track(typically at least 2 points are required). You then roll a die, and if you roll in the range listed on the track, you advance your marker. Players may only use one card per turn for the Space Race. There are some spaces on the track that offer VP rewards of two different amounts: The first person to get to that space gets the higher VP reward. Other spaces on the track offer upgrades and rewards, but again, only to the first player to reach that space. Should the second player reach that space as well, the special effect is immediately cancelled. The Space Race is often used as a “safety valve”, to dump events that would be of great value to your opponent and keep them from getting played. If, when this phase comes up, your marker on the Required Military Operations Track is not at least as far as the current DEFCON status, your opponent gains a number of VPs equal to the difference. Ex. After this turns actions, the DEFCON marker is at 4. US has played 4 Ops points worth of military operations, but USSR has only played 1. Therefore, the US gains 3 VPs. China’s large role in the Cold War is abstracted through the China Card, that starts the game with the USSR. The China Card does not count against your hand limit. Playing The China Card counts as one of your Action Rounds. After playing it, it is handed to your opponent, face down. After checking Military Status, the China Card is flipped face up, and is ready for use next turn. The China Card may not be played during the Headline Phase. If one player causes the DEFCON track to reach 1, they lose. If one player plays the "Europe Scoring" card and is found to be in Control of Europe, they win. A player controls a Region if the controls more countries there than his opponent and also controls ALL the Battleground countries in the Region. 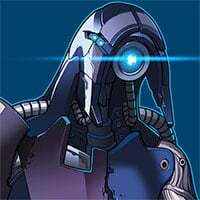 Starting in the Late War, a card called "Wargames" is available to be drawn. This event immediately ends the game after giving the other side 6 VPs. If one player gets 20 VP’s, they instantly win. If none of these occur, a Final Scoring occurs. Every region is scored as if its scoring card had just been played. Add 1 VP to the player currently holding the China Card, and determine which player has the most VPs. That player wins the game. This game will follow the Farangu Format (TM) and take place on a VASSAL game being run on my computer. I’ll keep your hands on my VASSAL game, and PM you your hand at the start of each new turn. You can declare your choice of Headline event in PM, but all other actions should be posted in the thread. The OP/SP contain everything you need to know to play, but for those who prefer an encyclopedic knowledge of the rules, the full Rule Book is available online. For people who want to learn basic strategy. This game WILL be using the optional cards. I'll start this up Tuesday night, US time. Cards going out & each side may place starting Influence - first, 6 in E Europe for USSR; then 7 in W Europe for US. Then PM me your Headline cards. Sparked by fears that the “enemy is among us,” the “red scare” hit its apex with Senator Joseph McCarthy, and the hearings on “Un-American activities” in the House of Representatives during the 1950s. Soviet purges were a notorious aspect of power transition within the Kremlin. However, Stalin was the true master; 12 million people were imprisoned in his camps at the time of his death in 1953. On June 5, Secretary of State George C. Marshall announced to the world the US plan to reconstruct all of Europe. Due to Soviet pressure, Eastern European states did not participate. However, for the 16 nations of Western Europe that did, the Marshall Plan marked the first step on the road to recovery and ultimate victory in the Cold War. US is scared. Ops are at -1 this turn. My headline will be Marshall, with influence in WGermany, Italy, Greece, Turkey, Spain, UK, Canada. Comecon for points. 1 inf in Lebanon and one in egypt. @Phyphor‌ to place 4 inf in eastern europe and than play his 2nd action. Olympic Games for 1 Op, 1 inf in Lybia. The People’s Republic of China played a pivotal role during the Cold War. While the PRC’s influence was largely limited to satellites in Asia, the country was important to the uneasy balance of power that ultimately descended upon the post-WWII world. While beginning as an ally of the USSR, China became a counter-balance to Soviet influence in Asia during the later stages of the Cold War. The Council for Mutual Economic Assistance (COMECON) was founded in reaction to the allure of the Marshall Plan to the Soviet satellites in Eastern Europe. While very loosely organized and dominated by the Soviets in its early years, COMECON would ultimately fulfill the role of trade liberalization and industrial rationalization for Eastern Europe. The US Congress passed into law the Federal Civil Defense Act, in reaction to the first Soviet tests of nuclear weapons in 1949. Duck and Cover is perhaps the most memorable of a variety of civil defense efforts to raise awareness of nuclear attack. Ironically, such films may have assisted in increasing the possibility of nuclear war by making the possibility of such a conflict “thinkable” by the general public. Sport often served as an outlet for the intense competition between the Superpowers, and that competition was never so intense as at the Olympics. The Olympics served as a test bed to see which society could make the greatest strides in human physical achievement. It fit neatly into Communist ideology of “the New Man.” The games frequently reflected the global political situation, as with the terrorist attacks in Munich, and became overt political tools with the US boycott of the Moscow games in 1980, and the Soviet boycott of the LA games in 1984. 1 inf in Yugoslavia. Europe Scoring. No point for anyone. Nasser For ops. 1 inf in Lybia. Egypt goes 2-0 for Urss. let's put 1 inf in Malaysia. @Phyphor‌ to play the point. Nuclaear test ban for ops. 2inf in Thayland and 1 in Indonesia. Defectors for ops. 1 inf in Jordan, 1 inf in Canada. @stever777‌ to wrap up the turn. Shouldn't that be 1 inf? Since booga booga red scare? 1 inf in jordan only. The Communist Information Bureau, COMINFORM, expelled Yugoslavia for Marshall Tito’s refusal to conform to Moscow’s wishes. Albania would ultimately follow a similar tack, breaking with Yugoslavia, then Khrushchev’s USSR. While remaining within the Soviet structure, Ceausescu’s Romania would also test the limits of Moscow’s patience with occasional flares of independence and nationalism. Some Cold War historians view the entire struggle, costing millions of lives, untold trillions of dollars, and conflict around the globe, as a struggle for the future of Germany. While that view may be too myopic, it is clear that Europe always remained in the forefront of strategy and emphasis. Defeat in Europe ultimately meant defeat in the Cold War. In 1946, Truman had to threaten to send warships to the Mediterranean to compel the Soviets to remove troops from Iran. Thus began the Cold War struggle in the Middle East. Since this region provided Western economies with their lifeblood—oil—it also provided the USSR with an irresistible opportunity to meddle. US support for Israel gave the Soviets an opening to the Arab world that they would repeatedly exploit. 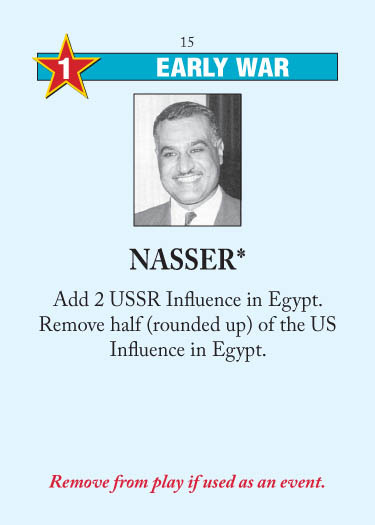 One of the giants in the Pan-Arab movement, Gamal Abdel Nasser rose to power through military coup. Attempting to steer an independent course during the Cold War, he provoked western governments by accepting Soviet aid, and nationalizing commercial property—the Suez Canal being the most prominent example. Egypt, under his leadership, was viewed as a Soviet client, and would serve as a Russian proxy during repeated wars with Israel. He died in office after 18 years of service, having frustrated the attempts of a variety of domestic and international enemies. The first Nuclear Test Ban treaty owes its origins to the de-escalation process that followed the Cuban Missile Crisis. It prohibited further nuclear tests in the air, underwater or in space. International pressure for such a ban mounted in the 1950s as scientific evidence began to document severe environmental damage caused by earlier atmospheric testing by the nuclear powers. Underground testing remained an allowable methodology, but all forms of “peaceful nuclear explosions” were also banned, tightening the non-proliferation regime. While it is hard to put precise dates on the decolonization process, those dates chosen represent two of the most significant decolonization successes. Sparking the retreat from empire was Britain’s fulfilled promise of independence for India in 1947. At the other extreme, Rhodesia’s first majority elections spelled doom for the apartheid system. Preceding the start of the Cold War, citizens of the Eastern bloc fled or defected to the West. Defectors came in two primary archetypes. Spies and double agents who had been discovered or needed to “come in from the cold” would frequently flee to their masters and allude capture. Examples of this type of defector include KGB Deputy Chief Yuri Nosenko and KGB London Bureau Chief Oleg Gordievsky. Perhaps more embarassingly, and certainly more publicly, many talented Soviet artists defected while on tour in the United States or Europe. While the West also suffered occasional defections, particularly from westerners involved in espionage, it never reached the same proportion or the same level of public spectacle. * U.S. player penalized 2 VPs. * Coups and realignments now allowed in MiddleEast. PM me you Headline cards for Truman turn. The Cambridge Five (Kim Philby, Guy Burgess, Anthony Blunt, John Cairncross, and Donald Maclean) were British civil servants who, unbeknownst to the British government, had become Communists while at university, and recruited as Soviet agents shortly thereafter. The spy ring was one of the most effective Soviet intelligence efforts of the Cold War, as all five rose to positions of great responsibility and trust in the civil service. Maclean, in particular, was privy to a large number of nuclear secrets; the information regarding the size and readiness of the Western nuclear arsenal played a key role in Stalin’s decisions to blockade Berlin and to arm the North Koreans for their invasion of South Korea. The spy ring fell apart when the U.S. VENONA project exposed Maclean; he and Burgess defected in 1951. Philby was able to elude exposure until 1963, passing secrets all the while; he too managed to defect. Blunt was unmasked around the same time, but secretly gave a confession, exposing other agents (including Cairncross). King Michael I, a westernized monarch, was forced to abdicate his throne at gunpoint. Romania was thereafter declared a democratic socialist republic. After the death of its first communist leader, Gheorghiu-Dej, Romania was ruled by Nicolae Ceausescu, second only to Stalin in cruelty to his own people. * US player has no scoring cards. De Gaulle lead france as event first (1 URSS Inf in France) than 3 inf in France. With EEU I choose, not you, so I'll choose Poland, Austria and EGermany. Than, I'll play UN Intervention On Socialists governments to play the 3 ops without fireing the event. 1 Inf in France, 1 in Jordan and 1 in Saudi Arabia. US/Japan Mutual defense pact as ops. 3 Inf In saudi Arabia and 1 in Canada.